Put in the hot miles without breaking sweat. Much. Summer running, happens so fast. The weather's great, the evenings are lighter and all of a sudden it feels a whole lot easier to get those autumn marathon training miles in. Running bliss. Not to mention the arrival of the big glowing orb in the sky (at least for some of the time) also provides the perfect excuse to do what most runners love second only to running: buying new running kit. Out with the tights, gloves and winter warm gear and in with breathable, sweat-wicking, technical garb to keep your running - and 'look' - cool. While you can just stick on an old t-shirt and head out, technical fabrics and innovations have taken running clothing to a whole new level. All the big brands now boast their own heat management systems with impressively scientific sounding names, and while some of it might sound like marketing jargon, there is plenty of science that shows that regulating body temperature is vital for to keeping your heart rate where you want it. It's also impossible to underestimate the importance of comfort, and of looking like some kind of athletic, tech-fibre-clad ninja. This is our top pick of performance-boosting summer essentials for your running wardrobe. We all know heavy sweat patches aren't the best look, so this baselayer from Odlo will come in handy in the hotter summer months. The breathable fibres contain antibacterial silver to stave off the worst of your sweaty odours, while the 3-D knit technology guarantees superior ventilation. Available in four colours. The basic truth of physics is that energy cannot be created or destroyed, only transformed from one form to another. Thanks to an award-winning insulation zone built into the spine, this shirt helps to keep your body at a steady 37 degrees, by partially outsourcing your body's thermoregulatory requirements. UnderArmour's fanbase raves about the comfort of its gear. This latest compression shirt is a 'second skin', comfortable enough to be worn all day, with an intelligent 4-way stretch fabrication that gives you the extra mobility when you need it. It also provides a UPF 30+, so perfect for those who find sunscreen too much of a sticky mess. This is a lightweight, windproof outer layer than packs down tight and tiny into its own little bag for easy stashing on the move. It's perfect for those British summer days where you're not sure whether the sun's going to stay out or rain will stop play. Weighs just 106g. AK is the range from American running legend Anton Krupicka. While this vest is designed for trail and ultra runing, it's also great for longer runs in the urban jungle. Crucially, the easily-accessible holsters are adjustable for your water, phone, camera or other accessories, making this like a flexible, lightweight SWAT team vest, but for summer hydration rather than stopping bullets. 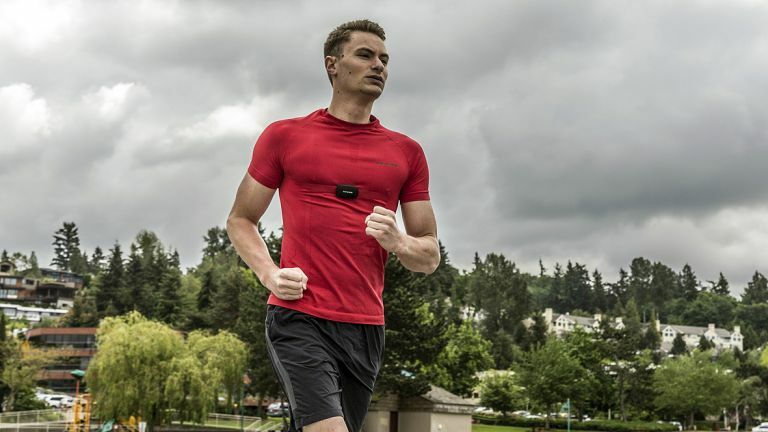 A Kickstarter rather than a shippable product at the time of writing, this heart rate monitor from smart apparel developers Sensoria is a leap forward in real-time coaching. When it gets warmer, your core temperature can rise and that affects heart rate, so knowing what's happening in real time can be the key to peak performance. Sometimes, simple is best. Sure, this running shirt boasts speed evaporating drying, microporous additives to remove moisture and stitch-free construction, but at its core this is a lightweight, well-ventilated and inexpensive top that'll just keep you going. It weighs 100g and offers 360-degree reflectivity. The keyword here is 'adaptive'. Our Nike pick for the summer uses fibres that cleverly open to increase airflow when you're working hard and sweating and close again during warm down. The small hip pocket is a clever, convenient touch and the articulated seams make this a very comfortable top.